We Americans ( as in U. S. of Americans) are an odd lot. We hang on to our hyphenated history as if being American is not enough. All my ancestors came from that darling little island across “the pond” that holds three little countries. If I’m ever diagnosed with multiple personalities it’s the English-Welsh-Scots blood in me at war! (I’ll spare you the percentages) Seriously, it puts me in awe to think of the day when any one of them got in a sailing vessel and left their families forever to start life in a new, wild land. I’ve waited long to see The Young Victoria, its US release eight months later than in the UK. And, with little fanfare. As my Netflix queue is almost entirely BBC period piece films, you will not be surprised that I searched this movie out. Now that its actress Emily Blunt has received a Golden Globe nomination, you may hear more of it. So here is Inktropolis’ first movie review. Your reviewer is a middle aged, female, obsessive-in-the-nicest-sort-of-way (see above) writer who happens to have a WIP (work in process) set in 1837, the year of Victoria’s ascension to the throne. If you want an unbiased movie review, away wi’ ye! 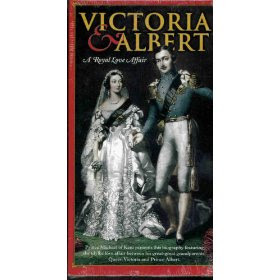 To prepare, I watched the A&E version of Victoria and Albert. I like to compare (we’ll talk Jane Austen movies another day) and then chase after facts: what was true and what was ‘dramatic license’. Both movies show us the confined life Victoria had as a child. Rather than give history on the royal family and their marriages to European monarchs, let’s leave it as Victoria was a shoo-in for Queen amidst the requisite royal intrigue. (You DO read Phillipa Gregory, don’t you?). Her widowed mother, the Duchess of Kent, was ‘guided’ by Sir John Conroy (played here by Mark Strong-- you ladies will know as one of Emma’s Mr. Knightleys and is currently the bad guy in Sherlock Holmes). Both mom and Sir John are disliked and publicly slammed by the sitting King, Victoria’s silly uncle William. He vows to stay alive until Victoria is 18 and can take the crown, lest her mother be appointed Regent. She turns 18. He dies. She does the crown and robe and scepter thing. The prime minister, Lord Melbourne begins his relationship as counselor and friend. Here’s where the movies really diverge. Each movie brings out a different “trusted adviser” to Victoria who offer the same advice: You must learn to live with Parliament, but politicians come and go and The Monarchy stays forever. Victoria matures, steels herself for public service and begins the job of ruling over/alongside two battling parties. Here’s another difference in the movies: The A&E movie's Albert resents the push and doesn’t love her until later in the marriage when time had softened his heart toward her—in fact, he’s quite resentful of his empty role as prince consort. 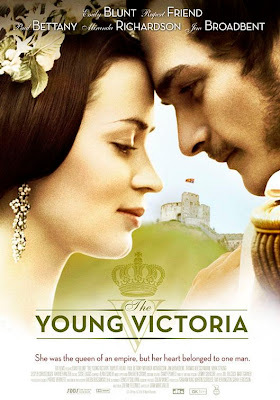 The Young Victoria’s Rupert Friend (some of you will recognize him as Mr. Wickham in the 2005 Pride and Prejudice, aka the Keira Knightley version) plays an Albert who falls in love with Victoria early and honestly worries she will not choose him. I think he does a smashing job of it. Both movies suggest a young man of intelligence who gives great advice--when she’s willing to accept it. He steers her consciousness to the common people and encourages her to respect deserving politicians despite their party background. The Young Victoria stretches the truth of an actual assassination attempt by having dear Albert shot while protecting his wife (after an argument, isn’t that touching?). This movie ends around the time of their first child’s birth, and felt abrupt to this seasoned movie watcher. All I can say is, "We are not amused." In case some of you don’t know what happens after this, I won’t spoil it for you. It is history, after all. For you Anglophiles, find the A&E version which gives a much longer look at the Queen’s life. Then, check out Mrs. Brown, with Dame Judi Dench. So that’s your very opinionated review of The Young Victoria. A movie I gave five stars to before I saw it, thanks to YouTube fan tributes, my UK and Australian sources and the movie's website. If you like costume drama, I think you’ll be satisfied. Well-filmed, beautiful scenery details, good casting and the costumes are amazing! I hope I’ve at least brought this movie to your attention. Leave a comment for a cool little memento of my visit to the theatre. I mean theater. Sorry. What's your favorite British history flick? Have you ever had Yorkshire Pudding? Would you like me to stop asking questions now? Deb, your excitement oozed off the computer screen and into my pores! For that...and the great writing...a dozen long-stemmed roses have been tossed your way. No rotten tomatoes!!! I will definitely see this film, though I don't know if it will make it out here to Normal. BTW, we do have a town-owned Normal theatre, a refurbished art deco gem, that occasionallyl shows "Beyond Normal" films. No comment. I am a nice Southern girl. I'm really hoping to get to the theater to see this one. Thanks for the review, Deb! I have plans to ditch the husband and check this out with a friend on Thursday. Can't wait. I'm a nut for costumes. Thanks for whetting my appetite even more, Deb. First I do read Phillipa Gregory. Favorite is the Wideacre series. Second, I do spell it "theatre" and you can't make me stop. The dance and drama world in America often uses this spelling. I like medieval films, what a shock. Of course "A Knight's Tale," r.i.p. Heath Ledger, and a number of others. "Princess of Thieves" produced by Disney is surprisingly good, and I think one of the first big roles for Keira Knightley. Sadly, I've never had Yorkshire pudding, although I spent 6 weeks in England living with English people. I did make a friend from Yorkshire, though, named Ashley. We loved to imitate his accent. Does that count? Deb, no rotten tomatoes from me. Some of my ancestors came across the pond in 1633 and settled in Connecticut. I've never been to either place, but I do have a burning desire to visit those three little countries you spoke about, and France and Italy, too. I've never had Yorkshire Pudding. Have you? Is it delish? I wonder if Anita is lurking around here. Someone went in and straightened up my tabs and cleaned up my spacing. Hmmmm. Lisa? Good Morning. I'm confident you ladies will like the movie. Not so the Yorkshire Pudding. But it will always remind me of Roast Beef dinners at my Uncle's house. It's sort of like Naan bread for the Anglo Soul. A thin batter bread good for soaking up gravy. The Young Victoria will be on my DVD wish list. e season. Thanks for the roses, Patti. I loved Amazing Grace, too. Nice to see my Inky sisters this morning. I've never been to the U.K but I hope to make it. It's on my list after Italy! Thank you, Deb, can't wait to see it. My heritage is Scotch/Finnish but as a Cdn citizen, I feel very close to Victoria. I have several coins, both British and Cdn with her portrait and marvel at the history that has passed between the people who held them before me. Must be off... having get together - finally - with the city cousins. Heh. Sounds great, Deb. I'm putting it in my Netflix queue. I wish I could get The Scarlet Pimpernel with Anthony Andrews. I watched it when I was a kid and loved it. I also wish I could get Ivanhoe with Anthony Andrews. I was SO in love with Ivanhoe when I was a kid. Love both of those books. Melanie, I did just get the Scarlet Pimpernel in the last month. Netflix has it. Jane Seymour plays the actress (not for the first or last time). I'll watch for Ivanhoe. This movie is out on DVD in the UK but I'm not sure about the US release. I'll let you know if I find out. You're right, Debra. I just checked with Netflix and they do have Scarlet Pimpernel with Anthony Andrews. I put it at the top of my queue. But they don't have Ivanhoe. :-( I'm very sad about that. If Netflix doesn't have it, it must be really hard to get. I tried to watch the newest version of Ivanhoe and didn't like it at all. And did you all know that Debra took second place in the Does Your Story Have Bite contest?! Yay, Debra! Congrats! Deb, I loved this review! Fun, fun, and I am so jealous b/c my town doesn't have this in theaters yet. Grr. Rupert Friend is a bit dishy, isn't he? I can watch and re-watch British-set historicals and romances. A film may dally with facts a bit, but I go all fuzzy and forgiving if the costumes, scenes, and love story is up my alley. How funny with this Anthony Andrews talk, I used to adore him. I loved the Scarlet Pimpernel and Ivanhoe and whatever made-for-TV Agatha Christie movies he was in. For a while there in the 70s/80s, Agatha Christie movies were a bit reminiscent of the Love Boat to me. Fabulous guest stars, a wee spot of intrigue, and luv. And Anthony Andrews. Yorkshire Pudding is not my favorite, sadly. It was always part of our Christmas dinner as I was growing up. My mom's Y. pudding is like a giant popover made with beef drippings and I am just not into it. But everybody else in my family is. Oh dear I really must see Ivanhoe now. I agree Susie, I can watch the costume dramas over and over. I ordered North and South with Richard Armitage, and the latest Jane Eyre with my Christmas gift Amazon gift card. And bought myself Bleak House from Santa. Can you believe I just finished watching P and P with Colin Firth? Of course you can. I'm still smiling. Deb, this movie sounds great. I love period pieces like this. My fave is Sense and Sensibility (the Emma Thompson version). I could watch that 1000 times and pick up a new little nuance every time. And I use "theatre" when referring to a place with live performances and "theater" for a place that shows movies. Brava. Good stuff. I'll look forward to seeing this movie. I spent an entire semester in Britain and never had Yorkshire Pudding. Thanks for the review. I wanted to see this movie anyway, but now I REALLY want to see it. I can hardly wait for it to arrive in my town and/or appear on DVD -- whichever comes first. THanks Molly - you'll enjoy it!